Syrian President Bashar al-Assad has told the Sunday Times that the Syrian conflict can be described as something “between the Cold War and Third World War,” adding that Syria is struggling and has little international support. “We call it a world war, but it’s a world war against Syria, tens of countries against us, sending those terrorists money and logistics, whereas our army is only Syrian, so we struggled,” he said in the interview released on Sunday. Assad also noted that he sees no solution in sight, because the other side has powerful allies, and they are interfering in the situation in Syria. “To talk about a political solution while the other side is controlled by masters in Saudi, Turkey, the UK, the USA, and France is not realistic. The core of the problem is those countries are interfering. If they stop, then the terrorists will be weak and leave or be defeated, and then we can sit as Syrians and talk about solutions,” the Syrian president added. 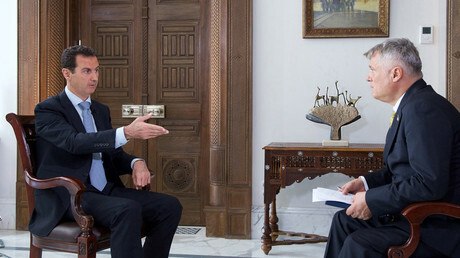 Given the dire state of affairs, military support from Russia has been essential, Assad said. “What made the difference, of course, was firepower. They have firepower we don’t have,” he said, noting that, while other allies in the region have provided help, it has been far from enough. “At the end we were fighting an unlimited reserve of terrorists coming to Syria and we struggled, so Russian firepower and Iranian support has compensated,” he explained. “They know if Syria loses the war against terrorism, this terrorism will prevail in Europe, and that affects Russia and everyone in the world,” he concluded. 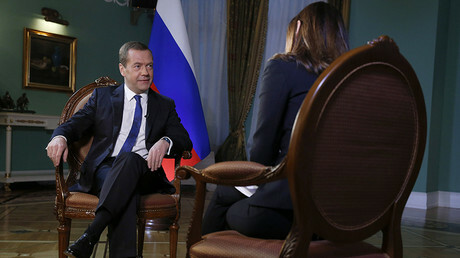 Meanwhile, Russian Prime Minister Dmitry Medvedev said in an interview with Israel’s Channel 2 TV released on Saturday that Russia’s primary aim is to enhance its own security by preventing the jihadists from former Soviet republics that are fighting in Syria from returning to Russia and carrying out attacks there. At the same time, on Sunday, the US-backed forces, as well as the ‘rebels,’ announced that they are launching a major offensive on Raqqa, the ‘capital’ of Islamic State [IS, formerly ISIS/ISIL] in Syria. The Syrian Democratic Forces, or SDF, said some 30,000 fighters are to take part in the operation. Reports say that militants within the city have begun putting up fortifications in preparation for the SDF assault and have reportedly forbidden the residents from leaving. They have also mined the approaches to the city and set up a network of checkpoints along them.